Spc. Spencer C. Duncan, 21, was killed in the Aug. 6, 2011, CH-47 Chinook helicopter crash in Wardak province, Afghanistan, along with 29 other U.S. service members. 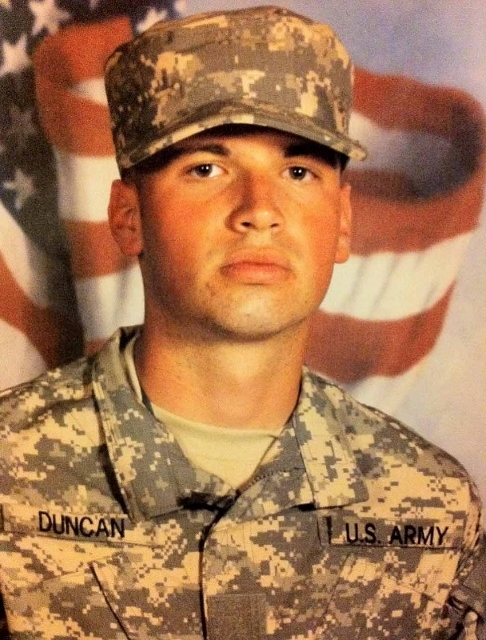 Duncan graduated from Olathe South High School in 2008 and enlisted in the U.S. Army reserves in June, eventually becoming a Chinook door gunner. He was survived by his parents, Dale and Megan Duncan, and his two brothers, Tanner and Calden. The Travis Manion Foundation honored Spc. Spencer C. Duncan with 31 other Fallen Heroes through our Character Does Matter program at the Westover School in Middlebury, Conn., on Jan. 18, 2013.